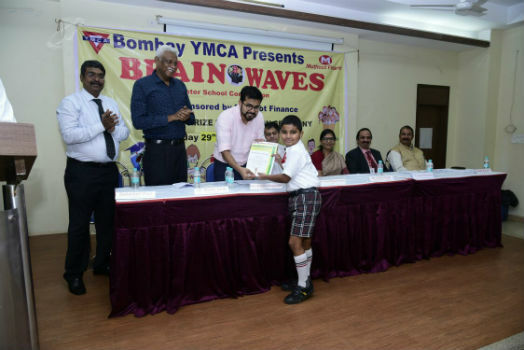 Mumbai, October 4th, 2017: Muthoot Finance Ltd, India’s leading gold financing company alongwith The Bombay YMCA organised ‘Brainwaves 2017’ competition. The exclusive programme was conceived and conceptualised to bring out the best in students and to create a platform to enhance their personalities. 474 students from 16 schools participated in the competition that included Short Story Writing, Poster Painting, General Knowledge Contest, Elocution and Story Telling. Brainwaves 2017 prize distribution ceremony took place in Smt. Jyotsna Harshad Valia Conference Hall, Valia College in the august presence of Mr. Ameet Bhaskar Satam, MLA of Andheri West, Mumbai, Mr. Eapen Alexander, Executive Director, Muthoot Group Mr. B. Venkat Ramana, Zonal Manager, Muthoot Finance and Ms. Sudha Singh, Municipal Corporate, K-West Ward. The winners were awarded with Rolling Trophies, cash prizes and a certificate. Maneckji Cooper Education Trust School won the Over All Trophy and Most Participation Trophy. Also present during the function were Mr. Sebastian Paul, Senior Secretary, Bombay YMCA Bandra Branch, Mr. Melvin Louis, General Secretary, Bombay YMCA and Mr. Austin Kunder, Assistant General Secretary, Bombay YMCA Andheri branch.